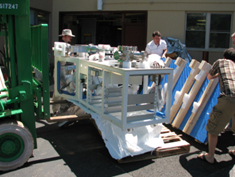 The newest ICP-MS in the Geochemistry/Cosmochemistry Group is the multi-collector (12 faradays, 4 multipliers) Nu Plasma HR that was installed in June 2009 as a replacement for our aging VG P-54. It is used for isotopic measurements of B, Si, Fe, Ag, Sr, Nd, Hf, Pb as well as isotope dilution concentration measurements of Rb, Sr, Pd, Sm, Nd, Lu, Hf, PGE, Re, U, Pb, and Th. 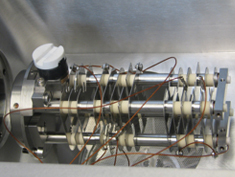 The second ICP-MS is a VG Axiom single collector instrument (2000 year vintage, refurbished in 2009) which was a swap from Ionflight Inc. for our aging multi-collector VG Axiom. 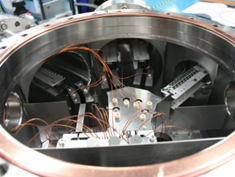 This instrument is used for simple elemental concentration work on unknowns, diagnostic work supporting the chemistry lab and tests for sensitivity for laser ablation analysis. 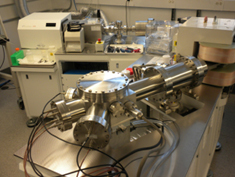 Laser ablation for ICP-MS instruments is accomplished using a newly installed 193 nm Excimer laser (Analyte 193.H) made by Photon Machines Inc.